Buying on our online gallery is hopefully an enjoyable experience for our valued database of clients, our carefully worded description gives buyers as much information as we can possibly put into text, we produce high quality images, and coupled with the knowledge that we belong to a certified body such as Lapada, certainly helps reinforce the message that our clients can buy with total confidence, but I believe we as individuals and possibly the industry could still offer more to alleviate any concerns first time buyers may have. 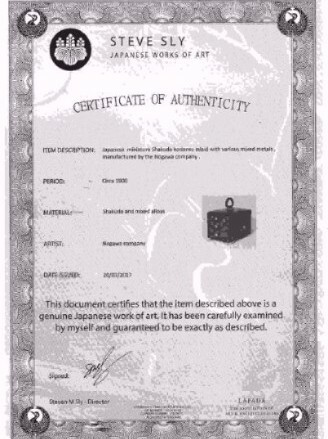 Recently one of our regular overseas buyers asked if we could supply him with certificates of authenticity, it was not something that we had considered if I am honest, but it was actually an inspired moment, when you consider that if for example you buy a high value branded watch, you automatically receive a certificate of authenticity, giving you total piece of mind, then why not with a unique and often high value Japanese work of art? Following this important clients feedback we are delighted to now offer a high quality individually printed and signed Certificate of Authenticity with each and every online purchase.